This data set provides hourly gridded soil moisture estimates derived from hydrologic modeling at nine AirMOSS sites across North America. The AirMOSS L4 RZSM product represents a temporal interpolation of intermittent AirMOSS L2/3 RZSM retrievals into a temporally-continuous, multi-layer, hourly soil moisture product. The L4 RZSM data have the same spatial resolution (3-arcsecs or ~100 m), and the same temporal coverage (generally Fall 2012 through Fall 2015), as the underlying L2/3 RZSM data. The L4 RZSM data were produced by the integration of the Level 2/3 product and other ancillary information into the Penn State Integrated Hydrologic Model (PIHM). 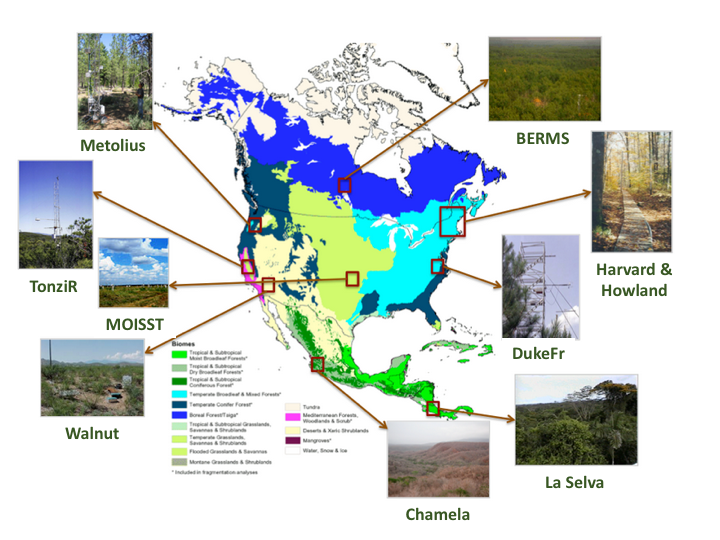 Many key applications for AirMOSS data products, including the calculation of net ecosystem exchange (NEE), require temporally continuous RZSM estimates such as those provided here. This data set includes 7603 files in netCDF (*.nc4) format. The algorithm theoretical basis document (ATBD) for this data product is included as a companion file. 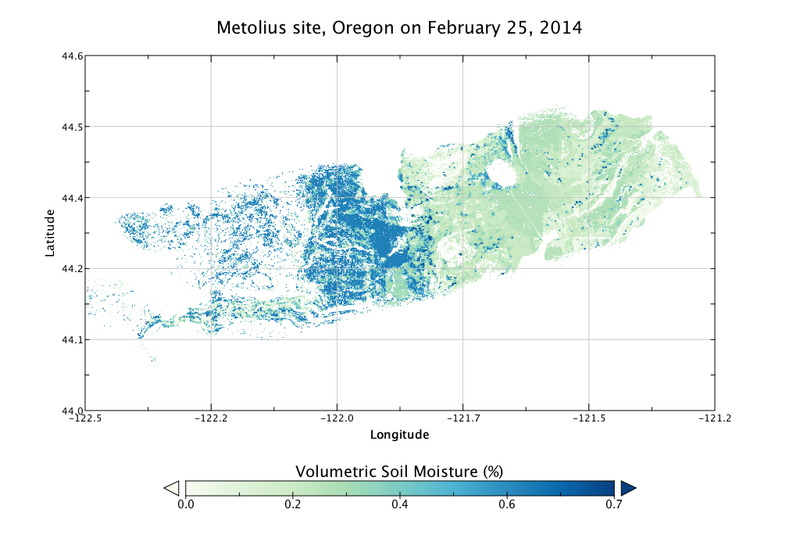 Figure 1: Modeled surface (0 - 10 cm) soil moisture at the Metolius site, Oregon, at midnight on Feb. 25, 2014. Temporal Coverage: 20120921 to 20150928. Coverage at individual sites is provided in Table 1. Table 1. AirMOSS sites. Note that L4 RZSM data were not produced for the La Selva, Costa Rica site. This data set includes 7603 files in netCDF (*.nc4) format. Each file represents one day at one site and contains 24 data layers, one for each hour of the day. The algorithm theoretical basis document (ATBD) for this data product is included as a companion file (L4RZSM_ATBD_V10.pdf). where: ssssss = site name; yyyymmdd = date; vv = version number. All sites except DukeFr are version 5. Table 2. Data fields in the L4 RZSM data files. Missing data are represented by -9999. Browse layer. Gridded soil moisture for the surface layer (sm1) at the last hour of the day. Gridded hourly soil moisture at depth 0-10 cm. Gridded hourly soil moisture at depth 10-40 cm. Gridded hourly soil moisture at depth 40 – 100 cm. Gridded hourly soil moisture at depth 100 - 200 cm. Not all sites and dates have sm4 data. Date and hour of modeled output. Each file contains only one day (24 hours) of data. The hydrologic model at the core of the L4 RZSM algorithm requires a diverse set of soil, geologic and vegetation parameters to accurately capture the flux and storage of water within (and out of) a hydrologic catchment. Failure to accurately specify these parameters can degrade the accuracy of model predictions. While all efforts will be made to minimize calibration error by considering all available stream flow and soil hydraulic property information, model calibration errors will likely persist and impact the accuracy of L4 RZSM estimates. Product error estimates are derived via the comparison of L4 RZSM algorithm output with independent, ground-based soil moisture observations acquired within individual AirMOSS study sites. Error estimates are shown in the ATBD document for this data product. For AirMOSS, NASA's Uninhabited Aerial Vehicle Synthetic Aperture Radar (UAVSAR) was flown on a Gulfstream-III aircraft, making frequent flights over ten sites (Table 1 and Figure 2) in 9 different biomes of North America over the course of four years (Chapin et al. 2012). The objective of the AirMOSS L4 RZSM algorithm is the realistic temporal interpolation of intermittent AirMOSS L2/3 RZSM retrievals into a temporally-continuous, multi-layer, hourly soil moisture product. 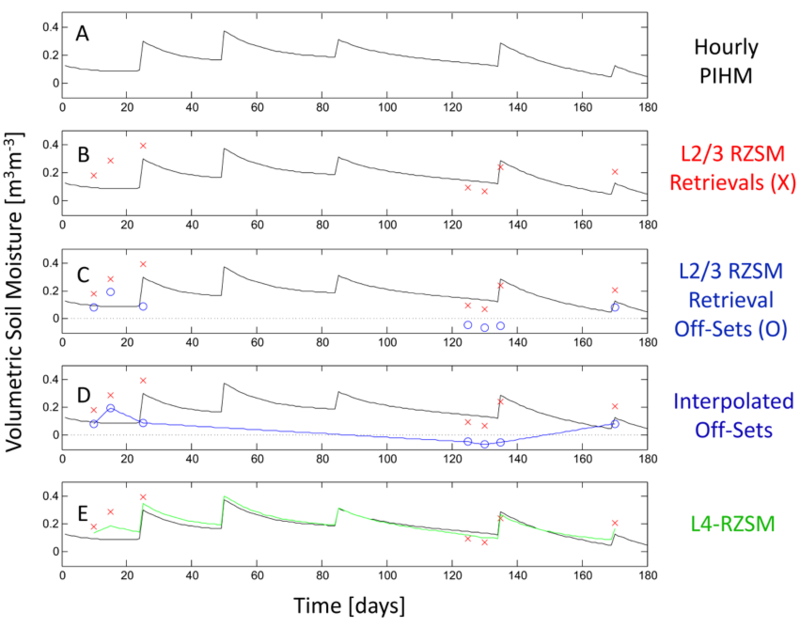 For information about L2/3 RZSM, see Moghaddam et al. (2016; http://dx.doi.org/10.3334/ORNLDAAC/1418). The L4 RZSM algorithm is based on the Penn State Integrated Hydrologic Model (PIHM; Figure 3) that makes continuous predictions about the evolution of soil moisture states in response meteorological drivers such as rainfall and incident radiation [Qu and Duffy, 2007; Yu et al., 2014]. Figure 3. 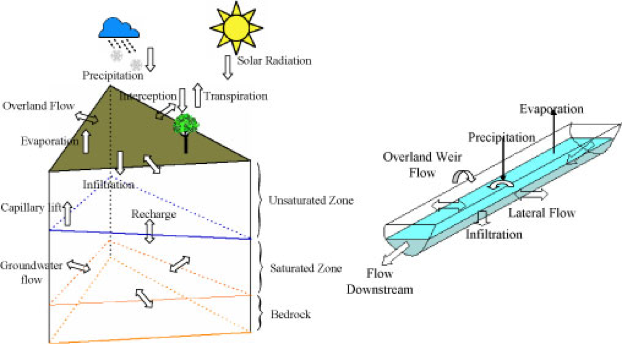 Schematic of physical processes represented in the Penn State Integrated Hydrologic Model (PIHM). (3) and pre- and post-processing stages required to transform RZSM products between specified AirMOSS project formats and the format requirements of the hydrologic model. Figure 4. Schematic of the AirMOSS L4 RZSM processing system. 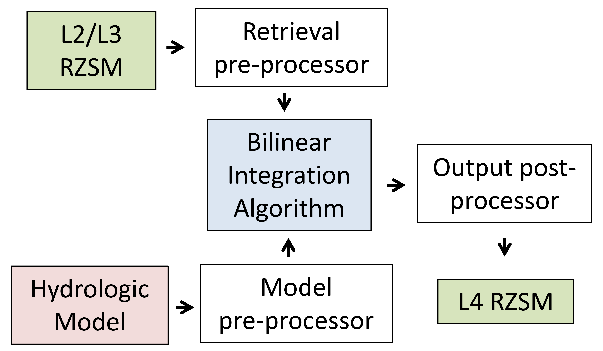 The integration of AirMOSS L2/3 RZSM retrievals in the PIHM model was based on a relatively simple bilinear-interpolation integration approach. Figure 5 provides a graphical example for a single PIHM soil layer. More details of algorithm implementation are given in the ATBD for this product. Figure 5. Example of the bilinear integration of AirMOSS L2/3 data with PIHM to produce L4 RZSM.